In this activity, students model a kidney's function. Using Ward's safe and non-toxic simulated blood and dialysis tubing, they observe water and molecule movement in a simulated kidney-filtration system. This activity demonstrates the importance of the kidney in removing waste and conserving water to maintain homeostasis in the body and employs the basic science framework concepts of Structures and Properties (LS1). This kit is aligned with all published National Standards. Pre- and post-laboratory assessments and vocabulary words target specific Did You Know concepts that link the real world with the scientific standards explored. The kit includes a student copymaster and material for 15 setups. 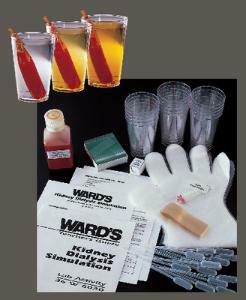 Ordering information: This kit includes unfiltered and simulated blood, dialysis tubing, clear cups, glucose-reagent test strips, pipets, microscope slides, coverslips, and disposable gloves. A compound microscope and distilled water are needed but not included.